Now I hope I don’t upset anyone, but we need to face the inevitable. 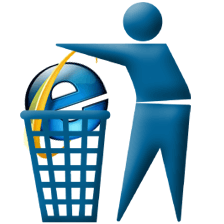 IE6 — a browser we’ve all learned to love — won’t be around forever. It’s survived longer than any of us could have expected and it still has a larger market share than Chrome, Safari, and Opera combined. Whilst some smaller web sites have dropped support for the 8 year-old browser, none of the bigger companies dared cut off a fifth of their users. Until now. YouTube, the Google-owned video sharing web site, is phasing out IE6 support. YouTube is one of the largest and most popular web sites on the net, so this action could have a massive impact on user numbers. Google have also added a Chrome download link in the sidebar when you visit with IE7, IE8, Firefox, Safari, Opera or any other browser. This idea was recently suggested on SitePoint to help increase Chrome’s popularity. Unfortunately, YouTube is not heavily used within the corporate sector. The current economic climate and legacy IE6 applications have prevented many businesses upgrading their browsers. We can only hope that more businesses either update their applications or adopt Windows 7 so they can run IE6 in XP mode when necessary. Finally, there are rumors that Digg are on the verge of dropping the browser. The hard-hitters have had enough — is this the beginning of the end for IE6?